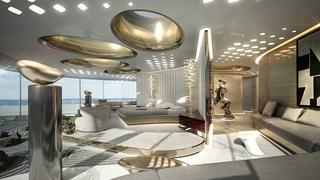 The Italian Sea Group presented its Admiral X-Force 145 yacht concept in November 2014, as Boat International reported, now we take an in-depth look at her stand-out luxurious design features The master stateroom on the Admiral X-Force 145, for instance, takes over its own dedicated deck and runs 55 metres long. The luxurious and inspiring yacht concept also boasts private balconies off the VIP suites, indoor gardens, focal point fireplaces and full-height sliding glass walls. The master stateroom on the Admiral X-Force 145, for instance, takes over its own dedicated deck and runs 55 metres long. The luxurious and inspiring yacht concept also boasts private balconies off the VIP suites, indoor gardens, focal point fireplaces and full-height sliding glass walls. The low-profile exterior design of the Admiral X-Force 145 yacht concept is by Monaco-based Dobroserdov Design, which has made good use of glass – including a continuous pane of glass running along the main deck level all the way to the bow, where an observation lounge is planned. The curved lines of the exterior are mimicked in the interior design as well. The entirety of the Admiral X-Force 145 superyacht is full of double-height spaces, including her double-height main saloon seen here. 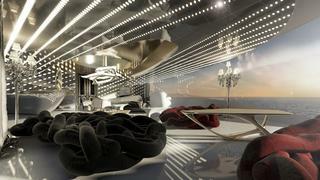 Other notable features of the design include two helicopter decks, a hangar housing a helicopter, toys and cars, two cinemas, multiple gyms and massive outdoor areas prime for sunbathing. 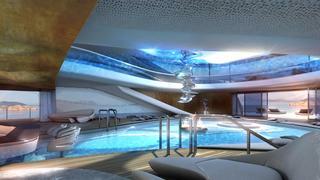 At the stern of the Admiral X-Force 145 is a double-level beach club and spa area, designed by Turin, Italy-based architect Gian Marco Companino Design. 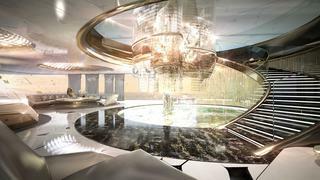 The interior of the entire yacht concept is contemporary and over-the-top while still being warm and inviting. The Italian Sea Group says the 145-metre superyacht Admiral X-Force 145 is no mere concept as it's been developed on the same naval platform of M/N Messina, a commercial diesel-electric vessel that the yard delivered in 2013. Beyond the naval platform, the Admiral X-Force 145 is all superyacht, though, as we can see in the previous images showing off her luxurious interiors. 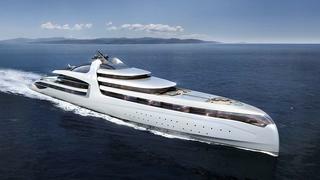 But designed on a proven naval platform, this luxury yacht concept might be a reality sooner than other wild concepts.